I left calculus a minute before the bell so I’d be the first to arrive at the student council meeting. I’m going to start my review with a question. Where was this book when I was in high school? I haven’t read the other novels in the Superlatives series. With that being said, I definitely intend to in the future. Most Likely to Succeed was an adorable read, yes, but more importantly it’s also a great lesson for all girls (and even grown women). I’m sure many of us remember worrying all too often about our “love lives” as teenagers. Will I get a boyfriend? Does he really like me? Am I attractive enough? What if boys get bored of me because I won’t do certain things? That’s definitely not an exhaustive list either. I love how Jennifer works these struggles and worries into Kaye’s story but that’s not the main thing we hear about her life. The pressures of school and family life are also very evident throughout the novel. The difficulties Kaye faces, her imperfect manner of dealing them (we all make mistakes and silly decisions), and the way she allows herself to eventually learn and grow from it all are what made this book extra special for me. Jennifer has written such an incredible, strong female lead. Kaye get’s caught up in boys and general high school things but it doesn’t make her any less intelligent, driven, ambitious, focused, or resilient. I also love how Sawyer isn’t what one would expect. Yeah, he’s the goofball/player/bad boy. Then we find out that he’s also intelligent, hard-working, a (metaphorical) fighter, and actually a huge sweetheart! Yes, I’ve claimed him as a new book-boyfriend to add to the list. He’s totally amazing. Sawyer reminds us that there’s often a whole lot more going on than we can see at any one point in time. People have problems they never feel comfortable sharing and sometimes even talents that they don’t let the world see because it goes against what’s expected. Sawyer teaches us to have compassion and to understand that everyone has a story, if only we take the time to let them open up and tell it. On a lighter note, Kaye and Sawyer are adorable. They’re such a fun pair. Their relationship is fun. The quips and cheekiness remind me of exchanges with some of my favourite people. Everything about them is just plain cute and makes reading the book even more enjoyable. 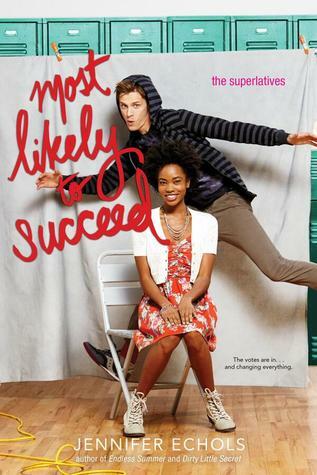 Every so often, my reading ‘taste buds’ need a little dose of sweet and Echols’ Most Likely to Succeed was like one of those cupcakes or macarons I spend way too much money on and enjoy every second devouring. In fact, I think I’ll need a trip to Nadège when I read the other books!! I could have learned so much from Most Likely to Succeed or any book like it as a student. It’s an incredibly fun read but it can also teach you a lot and get you thinking. I love, love, loved Kaye and Sawyer’s story and I can’t wait to dive into the other Superlatives books!